SSC is a statewide club, bringing small equine enthusiasts together. They warm your heart and make you smile! 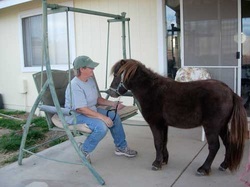 Miniature horses and Shetland ponies are more than larger than life pets! They are working animals and love a job to do. Like most domestic animals, minis and Shetlands love to be with their people. But what does one DO with them, really? Explore our website and see the many joys and wonders of owning miniature horses. When well cared for, not over (or under) fed, and exercised regularly, a miniature lives a long life. One family boasts that their miniature had taught Mom to drive. When Mom grew up, married and had kids, the same mini taught them to drive, and is now actively teaching the grandchildren! The small stature of Miniature horses and Shetland ponies make them ideal for young children, challenged lovers of horses, and the elder generations alike. They don't eat much or take up a lot of space, making them perfect for today's economy. Their willing attitude, desire to please and just plain love of their people make them a perfect friend, companion and ally for all kinds of events, whether showing, trail driving, or even hanging out in the back yard having a chat. In the photo above are several minis; the horse in the foreground is a Shetland. Some of the group are new drivers, some older. All are enjoying a beautiful day learning new skills!